Ok, well, it was pretty much impossible to narrow this down to nine photos. These cover at least some of the highlights of the past year. They may not all be the best photos (even of mine), but they certainly cover a lot of what happened over the past 365 days in just nine pictures. Ainsley looking out over the bow of a Disney Cruise ship last January as we left Miami. Pagodas from an ancient temple in South Korea. Harry and Maggie hanging out on our stairs. Angela, Wyatt, & Ainsley watching the eclipse (well, what we could see of it through the clouds). My finished guitar boost pedal. Me sporting my first bow tie, which my family gave me for Father’s Day. Angela and the kids on one of several Fall hikes we did with our moms. It seems like a small thing, but of all the things I’m most proud of this year, it’s getting both kids riding bikes (without training wheels, etc.). 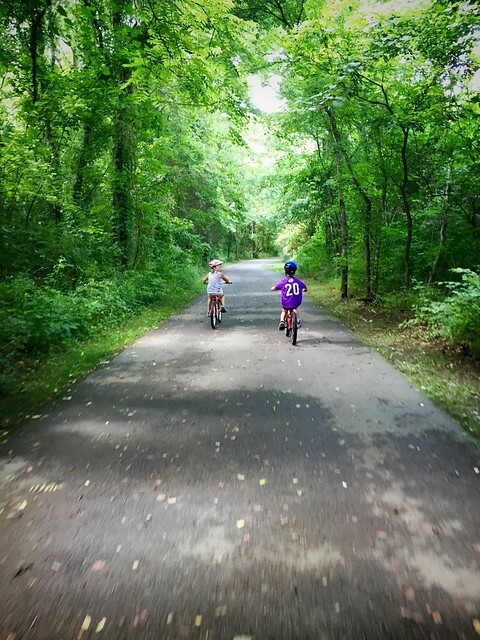 For Father’s Day this year, we went on an hour-long ride on one of the greenways in Brentwood, TN.